Now that everyone officially agrees Gnarls Barkley is played out, we can officially move on to a newer, better Cee-Lo project (finally!). In the Heart Attack (or is it Lovestink?) Cee-Lo teams with Jack Splash from the much under-recognized Plantlife to play a lot of old-school funk, combined with odd, quirky sounds provided by Jack Splash. Part of what attracted me to "Crazy" by Gnarls Barkley, was that song had a continuous beat and lacked a proper chorus, which allowed Cee-Lo to mold the song with just his vocals. 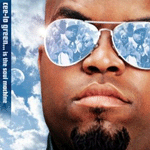 "Right On" uses a similar idea with a very simple guitar riff and focuses on Cee-Lo's phenomenal vocals. "Gangsta Boogie" on the other hand, is a little more out there, more akin to early Prince-style funk. No word on when this album will be released, but from the looks of it, i'll say the officially leak day is July 10th. not bad. I have the Plantlife album, I expected so much more after I heard you (and i think it was Jay) talk it up. same with this, its okay, but I really do prefer Gnarls. "played out" - so now that they have a hit we're getting the indie snobbery knives out? The track's actually called "Right Now" , and it's an INCREDIBLE salute to the classic soul-era. Cee-lo Green is a versatile cat with a deep voice and he can go all directions within music , as he has showed with all his collaborations and contributions through the recent years. Jazze Pha , the founder of Jack Splash & Plantlife , has inherited his talents well from his father , who is the Bar-Kays bass-player James Alexander , who once performed with the late & legendary Otis Redding.